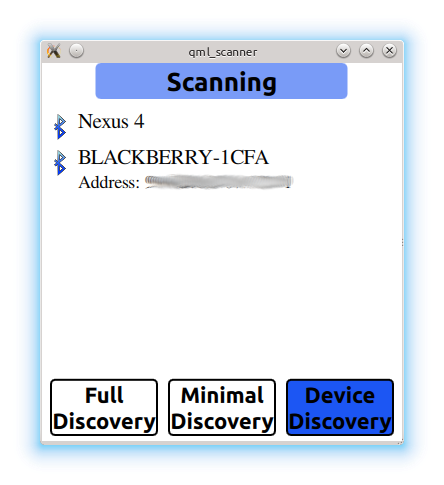 This is an example on how to locate Bluetooth devices in QML. The second and third type of scan dicover the types of services offered by each remote device. A full service discovery can take quite some time to finish. The local device connects to each remote device and performs an SDP enquiry. The results of such an enquiry can be seen below. 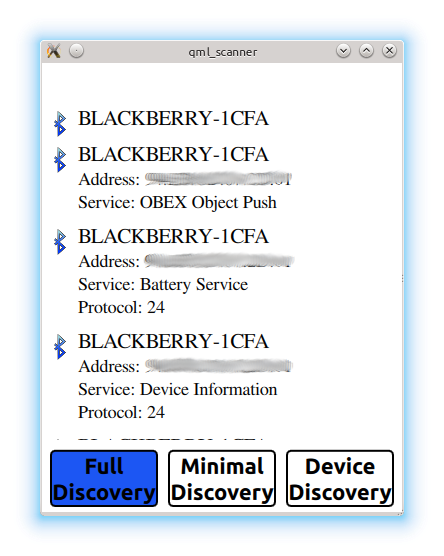 In general a service discovery is based on the results of a previously run device enquiry. A minimal service discovery returns the same data set as a full discovery except that the results are retrieved from local cache information and may not always be complete and accurate. The primary reason to perform a minimal discovery are time constraints. A full service discovery can take up to two minutes. Note that not every platform supports a minimal discovery. In such cases the API performs a full discovery.